Specialty Products Company (SPC) 45938 GM Lock Tab Socket Aligning these trucks can be difficult because it is impossible to access the head of the cam bolt to adjust alignment angles. 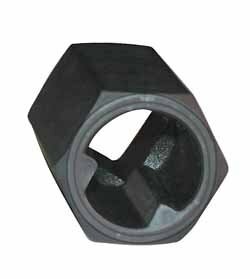 This special grooved socket fits over the end of the bolt allowing the technician to turn the alignment cams to change alignment angles after loosening the lock nut. This socket makes aligning these 4WD trucks much quicker and easier.